Eating healthy just got even easier with these delicious Strawberry Basil Chicken Kabobs! There is a restaurant close to my husband’s work that makes turkey sandwiches made with balsamic vinegar glaze that I absolutely adore. I really wanted to find ways to incorporate it into some of our other meals. Balsamic glaze can be found in some grocery stores by other salad dressings and is generally in a smaller bottle. It is a bit sweeter than regular balsamic vinaigrettes and it is so tasty! This recipe is also whole paleo and whole 30 approved, so if you are looking for recipes to stay healthy this is a delicious way to do so. In full disclosure my kids thought the chicken was good with the glaze on it, but they didn’t like the balsamic on the strawberries. You can decide whether or not you would like to put the balsamic on the chicken or both the strawberries and the chicken. I liked it on both and the basil gives it that fresh kick that really tastes like summer. Summer is a time to get together and celebrate. During the month of July we have a lot of family get togethers to celebrate the 4th of July, but also the 24th of July as it is our state’s holiday. Our city also celebrates for a week with a parade, fireworks, and entertainment the week between these two other holidays! So it would be true to say that we are gathered together with family and friends all month long and I love it! 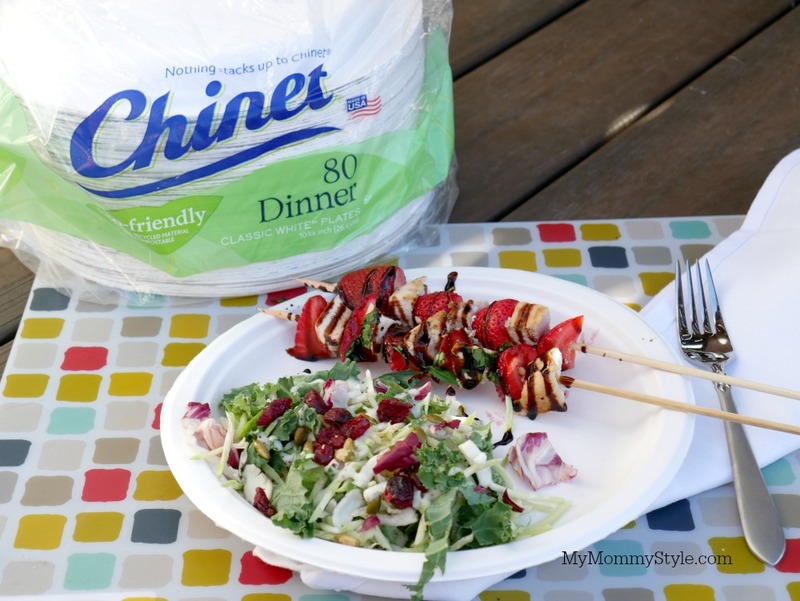 I love to buy a big stack of strong paper plates that I can use for entertaining to clean up is a breeze and I can get on to more important things like boating or going to watch the fireworks! Directions: Prepare grilled chicken until cooked through out on grill and juices run clear. While chicken is cooking on the grill sprinkle each side with seasoning salt or salt and pepper. While chicken is cooking prep your strawberries into bite sized pieces and cutting off the stem. Clean and chop fresh basil. Once chicken is cooked and no longer pink in the middle chop it into bite size pieces in preparation for putting them on the skewers. 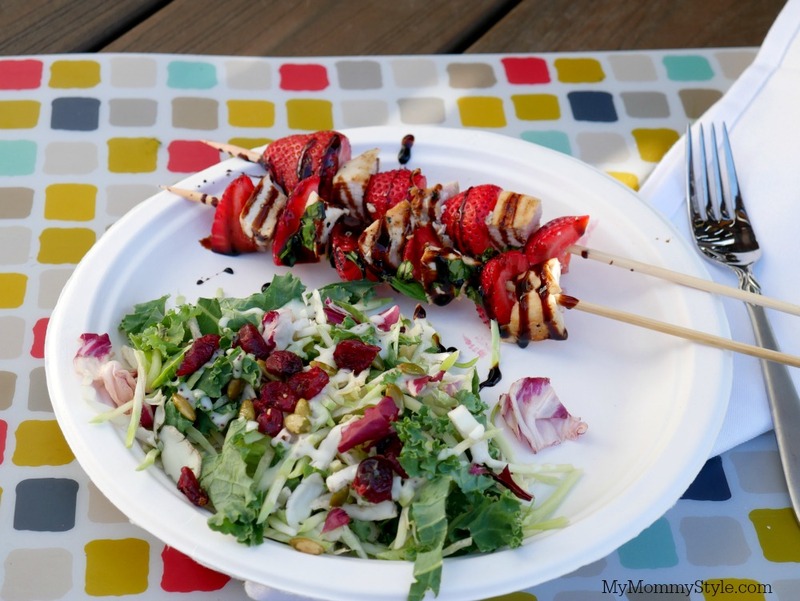 Assemble kabobs with chicken and strawberries, sprinkle with fresh basil and drizzle with balsamic glaze. ENJOY! If you prefer to marinate chicken beforehand you could add 2 tablespoons of extra virgin olive oil and 1 tablespoon of garlic to the mixture and marinate for at least 4 hours before cooking on the grill. Linked up with Tidy Mom and Tatertots & Jello.